Description of "Eerie Edges - The end you were scared of"
This book is an archive of all the lost emotions, those which people are afraid to exhibit, or those which they think make them weak. Words have the strength of ensembling every power on the earth and destroy the murk alive, with the virtue of love. The author here approaches to darkness, and brings out the beauty within through an apt placement of alphabets and weaving them with his creativity. Have fun reading the amazing compilation of quotes, poems and proses. Sameer Khan, a soul that has constantly wandererd amidst the emotions. As keen observer of the worldly scopes and scales, he has absorbed the potion of dark as well as the light. He is a simple, melodious human being, born to an Indian couple, tracing their roots back in Punjab. From aims as high as stars, to a personality so down to earth, he's a humble, creative, imaginative, empathising person, who is determined to fight depression from the face of earth. He firmly believes, pen has the power to empower the whole world to fight all the atrocities and make this world, a heaven to live in. He had a notion since a kid, that writing helped him bring out all the darkness residing within, helped him purify his soul. He has received acknowledgement for his intense plots and expression of pain, effectively on paper. He tries to display the most hidden emotions in a most agonising way. 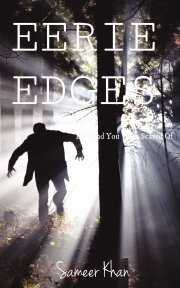 Reviews of "Eerie Edges - The end you were scared of"
this is a book filled with emotions, which one feels but cant able to express with others. feels scared that they will get labeled as depressed if they confess. Excellent,,deep thoughts, i could relate to every word of this magical book of poems, proses and tales. More blessing to the author. Bring out your next book soon. I will wait to buy it too.